Important news this week. The Encinitas City Council narrowed our choices to two maps for district elections, dividing the city into four sections of about 15,000 residents each, with the mayor’s office continuing to be elected city-wide. The city’s residents voted to have an elected mayor, instead of a rotational mayor, just five years ago. We held a special City Council meeting to deal exclusively with the districting topic, giving ourselves an extra meeting during the 90-day safe harbor period before we’re exposed to a threat of litigation. We are switching to districts, just as many cities across the state have done, because we don’t want to become embroiled in a years-long, expensive, legally uncertain litigation quagmire. Not everyone on the City Council agrees with this perspective, which at times has made our deliberation contentious. But we continue to move forward and will choose between the two maps at the November 8th City Council meeting. Here’s The San Diego Union-Tribune article. Of note, The San Dieguito High School District is proactively switching to district elections to avoid its litigation threat. The Coast News story is here. I was thrilled to warmly welcome Ron Dermer, the Israeli Ambassador to the United States, to Encinitas. He spoke at a luncheon at the Leichtag Foundation and also toured the Carlsbad desalination plant (which uses Israeli technology), while visiting from Washington D.C.
I’ve been consistently impressed with the high-level, accomplished and fascinating people that the Leichtag Foundation brings to our city. Ambassador Dermer was no exception! His address and our conversations included sustainable agriculture, food and water technology, geopolitics and biotech. On the left above is Daron “Farmer D.” Joffe, Director of Agricultural Innovation and Development for the Leichtag Foundation, Ambassador Ron Dermer, and Sam Grundwerg, the Consul General of Israel, who is based in Los Angeles. Deputy Mayor Tony Kranz, Assistant City Manager Mark Delin and I took a fascinating tour of the Caltrans/SANDAG construction project in Cardiff, which involves double-tracking the railroad right-of-way, widening the freeway by one lane in each direction, and dredging the San Elijo Lagoon for improved lagoon health, among other things. The engineering, design and construction of this project is so massive it boggles the mind. The bicycle and pedestrian improvements coming to Encinitas when the project is finished several years from now are particularly tantalizing. 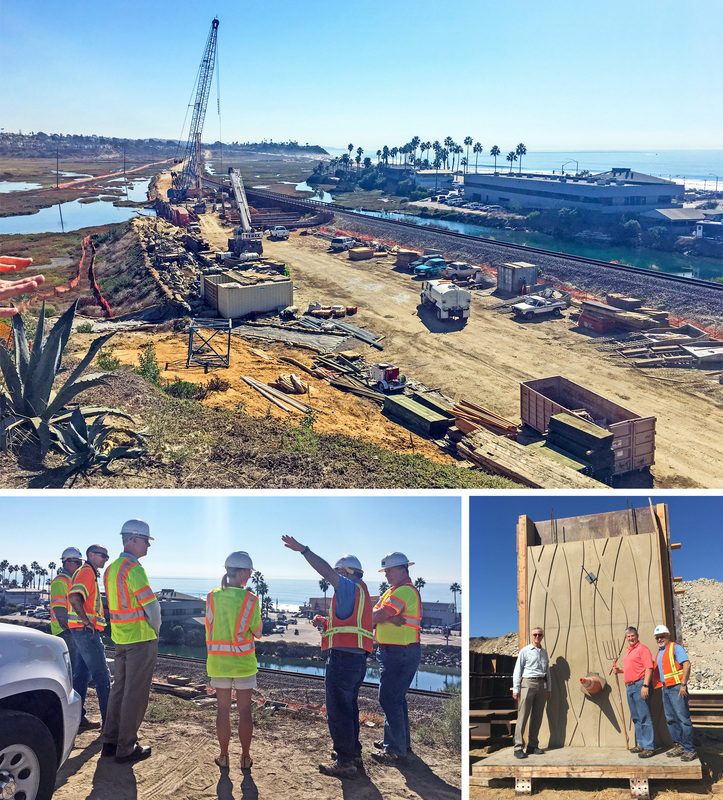 In the lower-right photo, Assistant City Manager Mark Delin, Deputy Mayor Tony Kranz and Arturo Jacobo, Project Manager for the Caltrans I-5 North Coast Corridor, are standing next to a section of the patterned retaining wall being built above the lagoon in Cardiff. 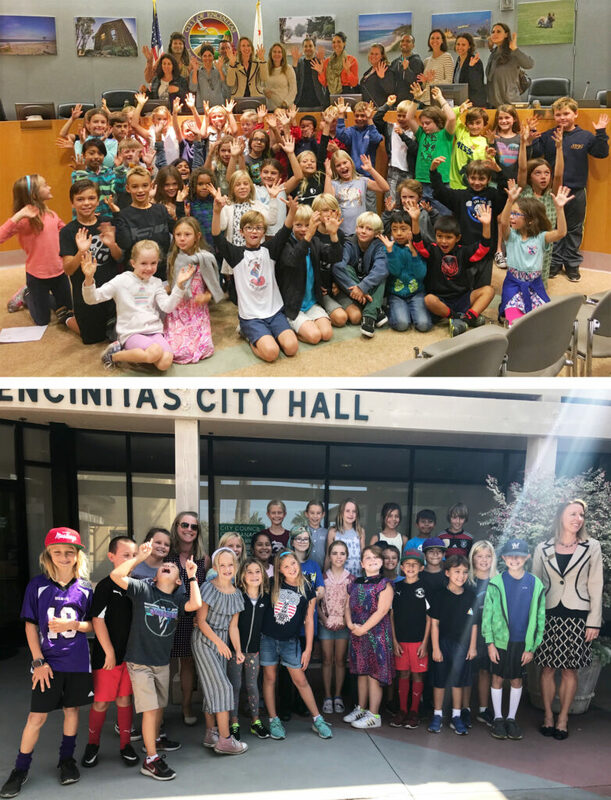 Third and fourth grade classes from Cardiff School and Ada Harris Elementary School recently presented their ideas on city improvements to mock City Councils made up of class parents. The students did a great job presenting individually and in well-organized groups about what we could improve in the city. One of my favorite ideas was that we allow more food trucks, particularly at places like the Encinitas Community Park. I also recently participated in a presentation from students at the newly founded Soul Charter School as they presented their own form of student government roughly based on the U.S. Constitution and other principles of representative democracy. I was tickled by a thank-you note from a third grader who wrote, “I appreciate that you invited the class but I thought your office would be bigger and fancier.” This makes me smile because I think civil servants’ quarters should be modest! 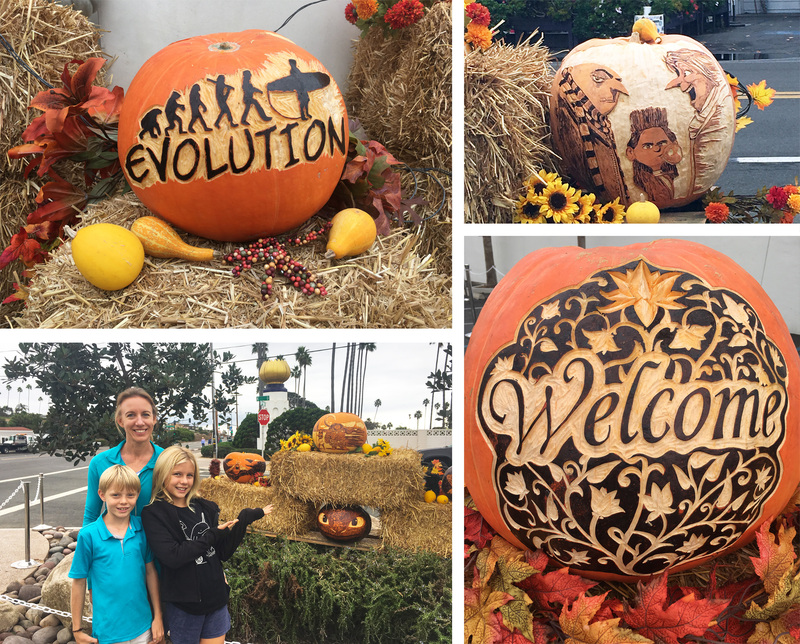 Some of the year’s all-around best pop-up art displays are the Halloween pumpkins created by the monks at the Self Realization Fellowship (SRF). Starting in the spring, they grow the massive pumpkins on the property they own across from SRF on Vulcan Ave., harvest them in early fall and create these stunning masterpieces for the community to enjoy. 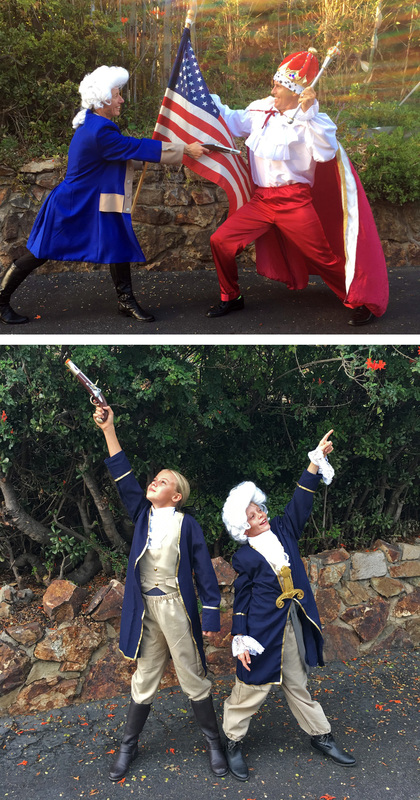 Continuing our fascination with the phenomenal broadway musical Hamilton, the Blakespear family thoroughly enjoyed ourselves this Halloween as we transformed into King George III and three Alexander Hamiltons. At the top, the British monarchy is unsuccessfully attempting to wrest the flag from America as I point my threatening musket at him! The king repeatedly burst into the Hamilton song “You’ll Be Back” to any American who would listen as we did the annual Trick or Treating loop with our neighborhood friends. I was happy to congratulate recipients at the 30th anniversary of the North County Philanthropy Council Volunteer Awards Ceremony; choose raffle winners at the city’s incomparable Dia del Los Muertos celebration; and represent the city on a regional panel about changes in state law related to accessory dwelling units. Finally, just a reminder that the Encinitas Mayor and City Council are always doing our best to represent you! Please let me know if you have anything on your mind that you’d like to share. If you’d like to discuss an issue in person, appointments can be scheduled by Council Assistant Shelley Wecker, who can be emailed at swecker@encinitasca.gov.